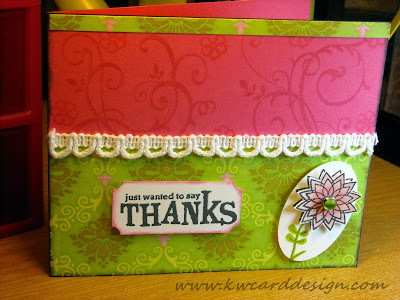 KWCardDesign : Just sayin' thanks! Happy Tues. evening blog readers- I'm back this evening to share another card with you. Tonight I will keep this short, sweet and to the point. I made several different cards over the weekend, and this was one of them. I have mentioned before that when I start to make a card, usually I don't have any clue of what I will make, and it always winds up becoming a surprise to even myself. This one was no different. I started out stamping the card base with my Flourish background stamp, and off I went. I love pink and green together. Those colors are so vibrant, and happy to me. I wanted to add some fun dimension, so I stamped this flower and added some Copic coloring, and then stamped the image again on my white card stock, and popped up the colored flower on top of the same image. I added a jewel toned green brad in the middle, and then punch it out with my oval punch. I thought I needed to add a little "something" in the middle of the card, and that is where the "hand- stiched" ribbon from Hero Arts comes in. I love this stuff. It is so simple, but adds such a quick elegant look that I was looking for. Hope you like!! I will be back soon for another card share. I wish you all a good night or afternoon where ever you are in the world! !